Microsoft Flow is a cloud-based service that makes it simple to automate common tasks and business processes across your applications and services, such as Office 365, Slack, Dropbox, SalesForce.com, Dynamics 365 and many more. Microsoft Flow entered Public Preview in April and since then over 117,000 people in 61,000 organizations across 139 countries have used the service to automate their business processes. With the help of input from this great community of preview users, we’ve steadily improved the product. Today we are announcing the General Availability of Microsoft Flow. That means Microsoft Flow is ready to support business automation around the world in 42 languages and six regions. With this release Microsoft Flow is ready for production use and you now get the 99.9% SLA you would expect from Microsoft. Today’s release also includes new administration, connectivity and usability features. Here are the highlights. Use environments to store your flows by geography or team. When you create an environment, you can pick its geographic location. Today, we offer the United States, Europe, Asia-Pacific, Australia, India, and Japan as regions, with more coming soon. Alongside environments, we are introducing the Microsoft Flow Admin Center. This centralized management console will make it easy for IT administrators to control the environments inside of their organization. Admins can establish data-loss prevention policies to control the flow of data and the use of services within their organization. Soon after general availability, admins will be able to also view the usage of services by its organization’s flows. Our goal is that Microsoft Flow helps users keep pace with their business needs in a secure and compliant way, while at the same time reducing the burden on IT. 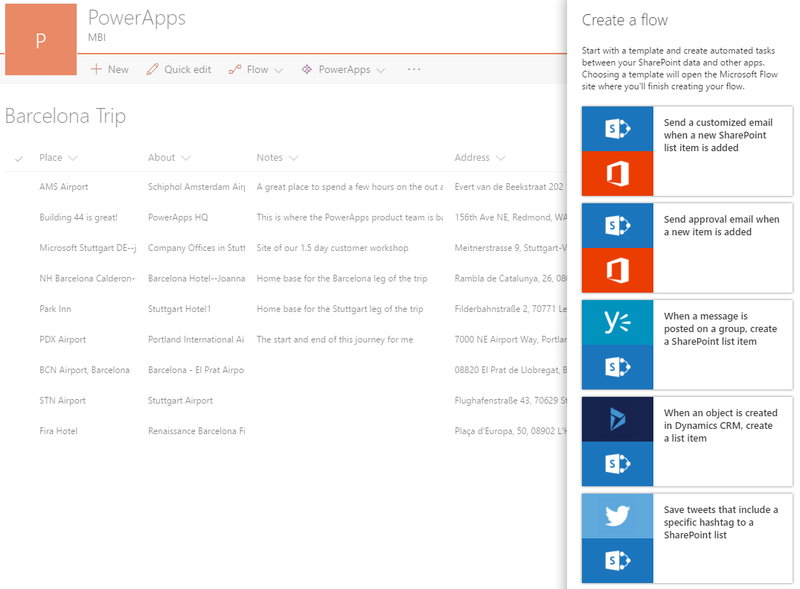 Whether you’re using desktop, iOS, or Android devices, Microsoft Flow is available for you. Today we are announcing the full public availability of the Microsoft Flow app on Android, joining the Microsoft Flow app for iPhone. Watch this short video to get to know our mobile app. Anyone can create flows directly on their phone. Browse our rich template gallery, navigate through our services list, search the gallery by keyword, or select a category of solutions. Even if you are new to Flow, we’ll help get you started with our new, ready-to-use experience, which makes it possible to wire up flows with just a click or two. Once you have your flows running, you can easily monitor their runs from anywhere, and get push notifications straight to your device. Finally, with flow buttons for mobile, you can easily and quickly trigger any action at anytime and anywhere. You can do everything from texting a colleague that you’re running late to a meeting, to triggering a new product build in Visual Studio, all with a single tap. In addition to standalone scenarios that make it possible for power users to automate repetitive tasks, Microsoft Flow enriches both Office 365 and Dynamics 365 with new workflow capabilities. In May, we announced that we would bring this connectivity to SharePoint Online. Today, we are proud to announce that every SharePoint Online user in the world can now use Microsoft Flow to take action directly from the context of their SharePoint Lists. In the coming months, we will be adding the ability to run any flow on demand for a specific document or list item. 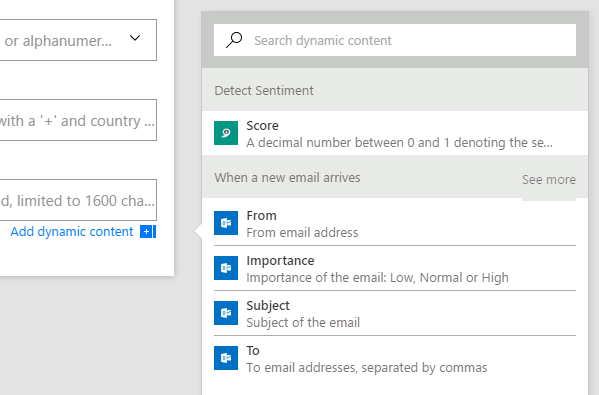 For Dynamics 365, we recently added the ability to connect to your data in Dynamics 365 for Sales, Dynamics 365 for Operations and Dynamics 365 for Financials. It’s easier than ever to move information from one part of Dynamics to another, or to move data in from outside systems. To better extend Office 365 and Dynamics 365, we are adding new services every week. Just this month we’ve added a dozen third-party services, including Bit.ly, Campfire, Cognitive Services Text Analytics, Instapaper and Pinterest. 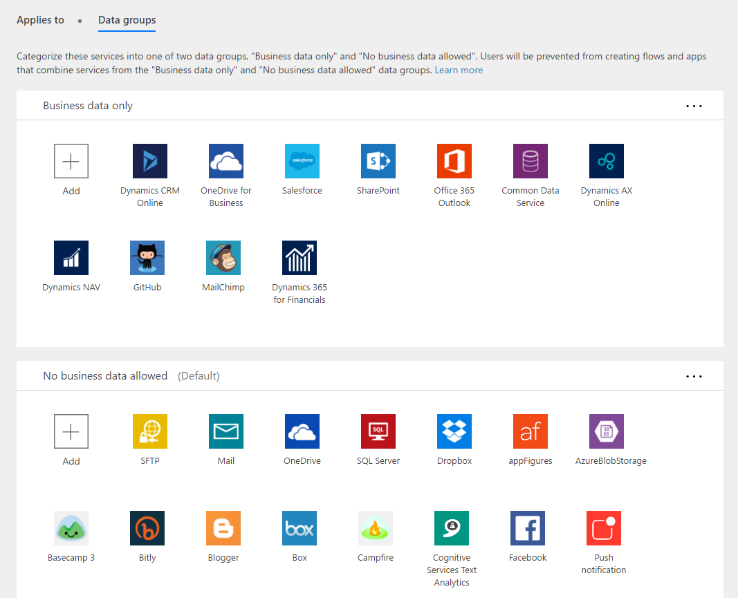 Microsoft Flow can also work with on-premises data in SharePoint Server or SQL Server. One of the capabilities that makes Microsoft Flow so powerful is you can use data from any data source, anywhere in your workflow. To make this easier than ever, we redesigned our experience so you can now search the dynamic content from all the steps in the flow. This makes it much quicker to reference exactly the data you need. Simply select "Add dynamic content" underneath any field and you can use data from any other step in the workflow. Microsoft Flow releases new updates every week to make it easier and easier to build simple and advanced business processes. Microsoft Flow is now available in both free and paid service plans. Using premium services like Salesforce and the Common Data Service is exclusive to Microsoft Flow Plans 1 and 2, and each plan has a different limit on the number and frequency of runs. As a special thank you, existing preview customers will receive a six-month free trial of our highest tier plan, Microsoft Flow Plan 2. If you are an Office 365 or Dynamics 365 customer, a Microsoft Flow plan is included with your license. Learn more about pricing here. Everyone can get started, for free, today. Sign up with any email at https://flow.microsoft.com. To get more involved, join our quickly growing community. Or, get a tour of what’s new and ask the Microsoft Flow team questions by registering for the Flow GA webinar today.